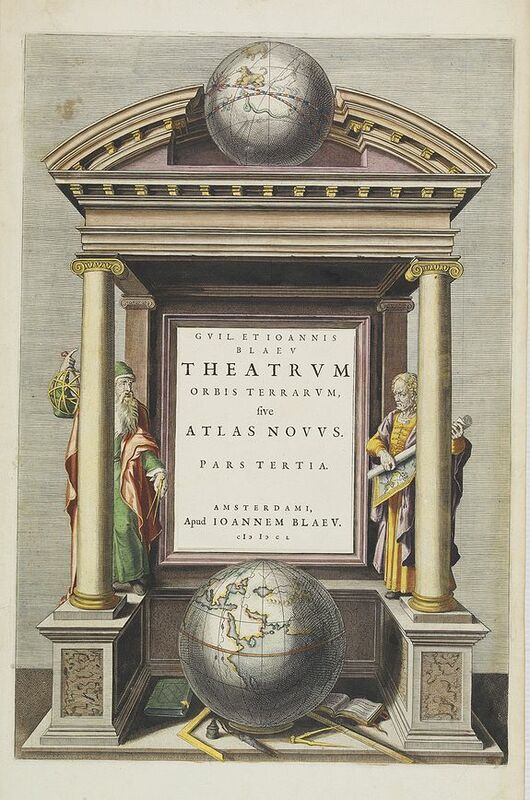 BLAEU -[Title page] Theatrum orbis Terrarum sive Atlas Novus pars Tertia. BLAEU, J. - [Title page] Theatrum orbis Terrarum sive Atlas Novus pars Tertia. [Title page] Theatrum orbis Terrarum sive Atlas Novus pars Tertia. - BLAEU, J. Title : [Title page] Theatrum orbis Terrarum sive Atlas Novus pars Tertia.. Size : 15.9 x 10.7 inches. / 40.5 x 27.2 cm. Description :The frontispiece of the third part of the 'Theatrum', by Johan Blaeu. Decorated with terrestrial and celestial globes and a astronomer and a geographer. Condition : Good margins. Paper slightly age-toned. Else good condition.